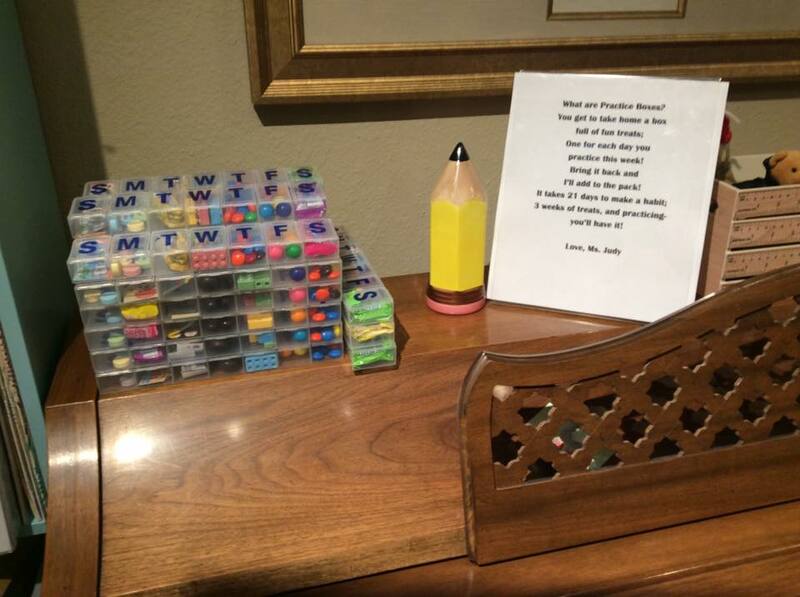 You are here: Home / Piano Teacher / Practice Boxes: A fun treat for your students! 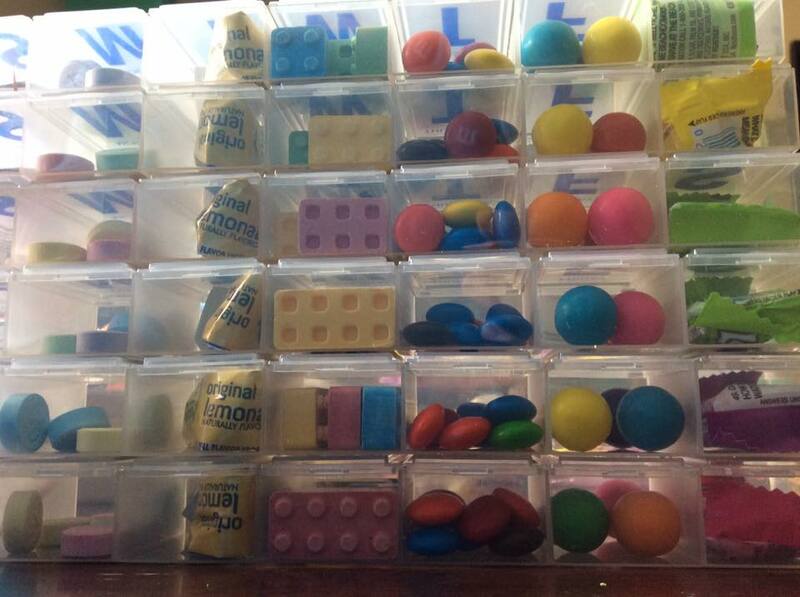 My students are SO HAPPY this week because I’m handing out my Practice Boxes. 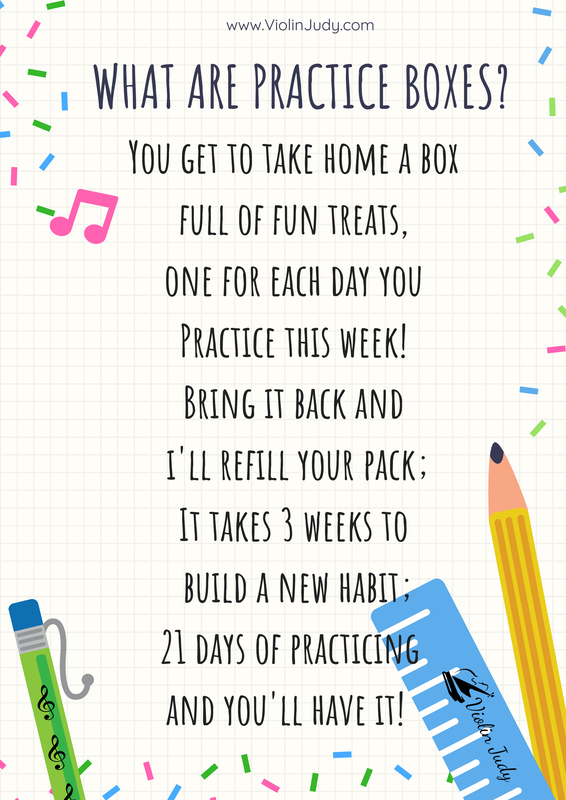 What is a practice box? 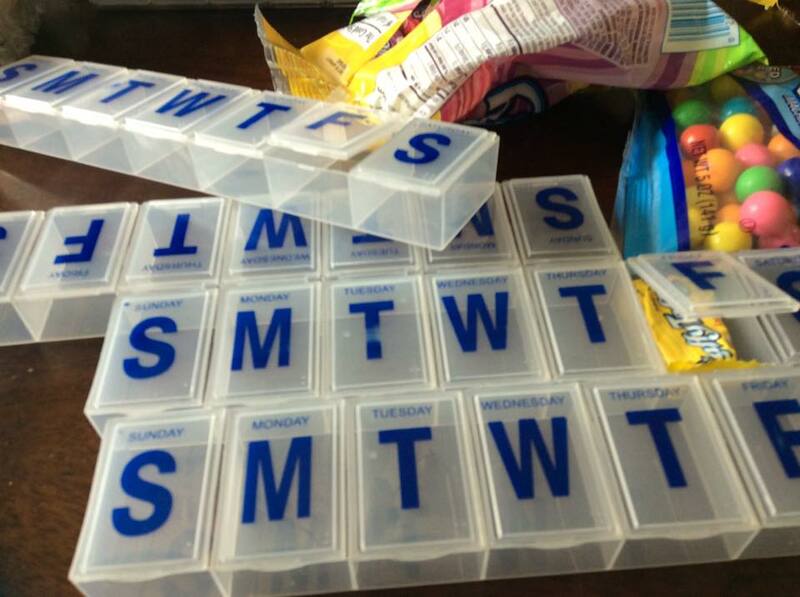 It’s any container with little compartments (I use a pill box like this:) I buy mine at the DOLLAR TREE for 1.00 each but you can find them on Amazon. 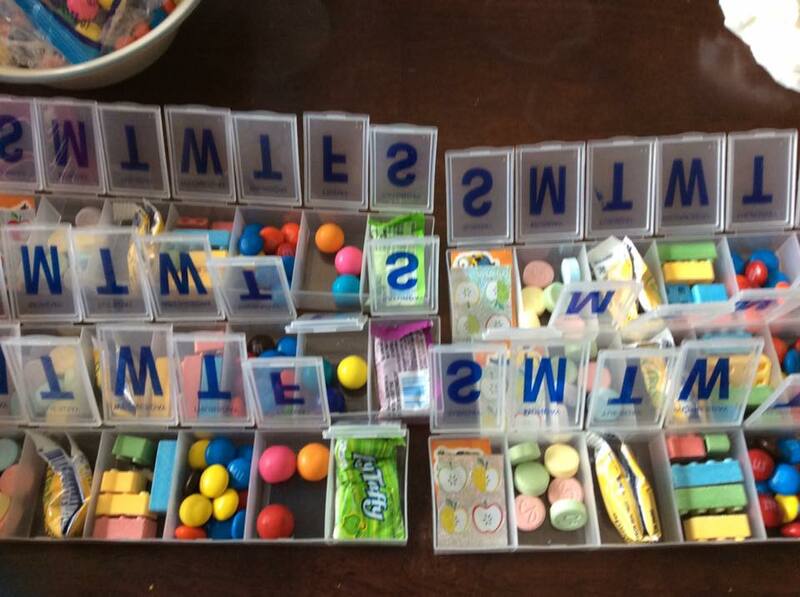 and I fill up the compartments with little treats like Candy, beads and little toys and stickers. 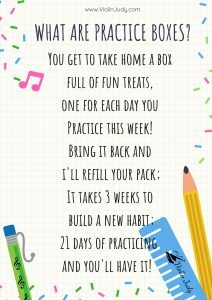 I give one out to each student, and tell them they get to have each day’s treat after they practice at home. They are instructed to bring it back to me for the next 2 weeks and I’ll refill it. I also wrote a little poem and posted it next to the boxes. If you’d like a free printable .pdf copy of the poem, just let me know and I’d be happy to email you one! I have a great freebie every month for anyone on my newsletter list, so please join in by typing in your email in the annoying little popup box. My pro tip for buying a lot at your local dollar tree is to call the manager and ASK if you can order a case online and if they will let you “return” the amount you don’t need for other items in the store, like small stickers, toys, candies, etc. to place in the boxes! You may need to call more than one store to achieve this goal, but it will save you the time and aggravation driving around to many different stores to get as many as you need! I hope your students like this reward as much as mine have! If you have done this with your own students will you please send me pictures I can post here to inspire more teachers? Thanks! Dont’ they just look SO FUN! How fun, Judy! Thanks for sharing. I bet the kids LOVE all the sweet treats! I love the idea of the poem you mentioned too – something besides sweets that’s a special treat! 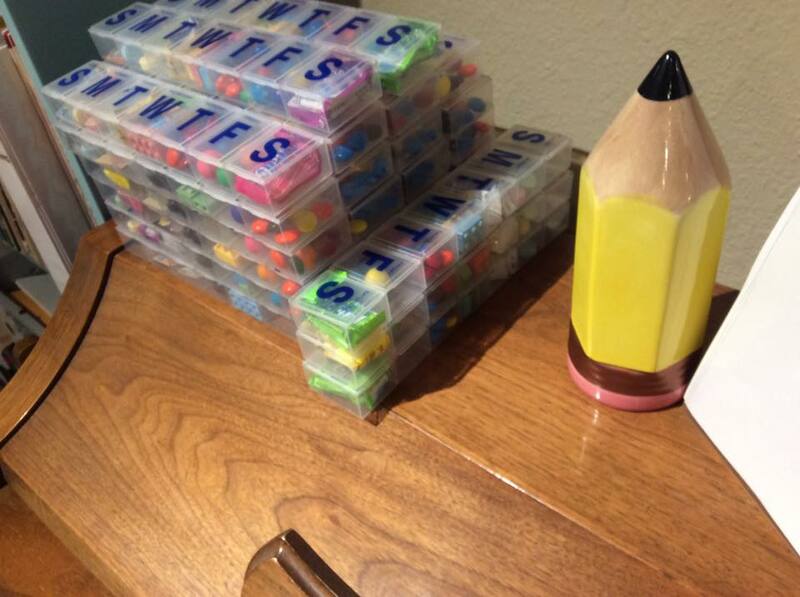 I also put a few ORBEES (or in my case “educational sensory beads”) in each week because my students LOVE those and honestly, I do TOO! Naomi-I want to make sure you received your copy of the poem. Just fill in your email in the annoying popup box as you leave any page (or hang out a long time) on my site. Thanks! I would love your poem that goes with, please email me if you get the chance! Such a fun idea!!! This is exactly what I was looking for September’s practice incentive! Could you email me the note you made up? Thanks so much and thanks for the great idea! Yes, my students did bring the same pill box for 2 more refills. 21 days total! We had so much fun with these!